The staff of SBGS found a citizen of Morocco in the capital airport. The foreigner wanted to go to Ukraine by a false passport of a citizen of one of EU countries. The Moroccan arrived to Boryspil by the flight from Istanbul. During the border control, he provided the passport of a citizen of France for control. 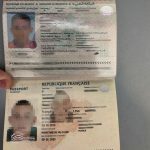 However, the border guards established that the document contained the signs of partial forgery, such as the replacement of informational pages with constituent data. Then, the border guards also found that the man purchased the French passport 3000€ and arriving to Ukraine he planned in a few days to fly to Italy. The foreigner was refused in border crossing and banned to enter the territory of Ukraine for the period of 3 years. He was sent back by one of the flight. This entry was posted in Translated Media-News from Ukraine on May 14, 2018 by oksana.